This shop has been compensated by #CollectiveBias, Inc. and its advertiser #FamilyFavorites . All opinions are mine alone. When I first started dating my husband 10 years ago, I couldn't cook to save my life. My recipe repertoire was made up of buttered noodles, grilled cheese and peanut butter sandwiches (no jelly). I also didn't eat "red sauce". Justin comes from an Italian family so not being able to cook and not eating red sauce made me pretty much unmarriable. To this day he still says that he considered my lack of liking red sauce as my biggest flaw in our early relationship. Thankfully over the last 10 years, I have not only learned to cook but I have also learned to enjoy pasta sauce as well. Usually I am the one who cooks in our house especially during the summer when I am off of work. But with teacher workdays starting in 48 hours, Justin is going to be helping out with family dinners as I deal with usual back to school stress. And if you knew my husband you'd know that Justin's meals almost always involve a sauce. 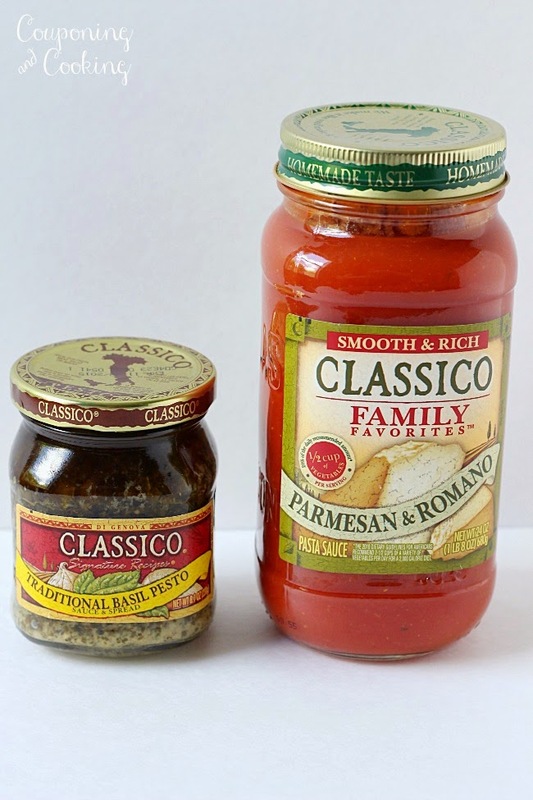 We always have a few jars of Classico pasta sauce in our pantry and I usually have a jar or two of Classico pesto on hand as well. Between pasta dishes, noodles, and make your own pizza night it goes pretty fast at our house. Walmart always has it for a great price so it's a budget friendly ingredient to have on hand. Justin and I love meals that recreate some of our restaurant favorites and these Parmesan Pesto Chicken Roll Ups made us feel like we were eating at our favorite Italian restaurant without actually having to leave the house. With a few pre-made, store bought ingredients and a couple easy steps you can have a filling and delicious family meal. We served ours with a spinach salad and garlic toast but the chicken can just as easily be served over a bed of pasta or risotto. 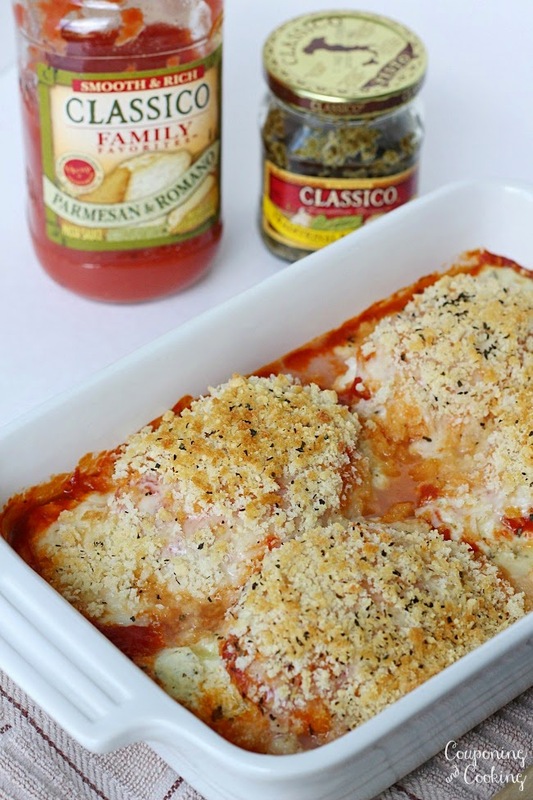 The Parmesan in the pasta sauce really complimented the cheeses we used in our filing and the panko parmesan bread crumb topping gave the whole dish a little texture without us having to bread each chicken breast. 1.) 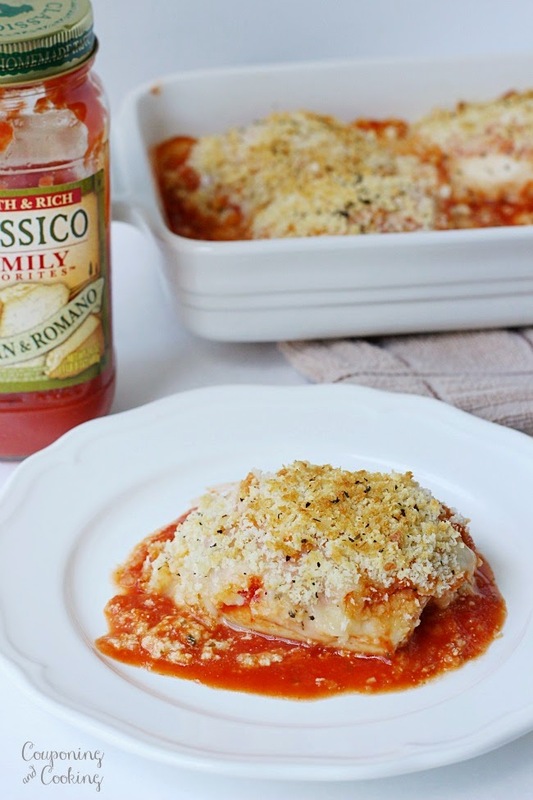 Coat the bottom of a small baking dish with a layer of the Classico Pasta Sauce. You just want enough to cover the entire bottom of the pan. 2.) In a bowl, mix together the ricotta, egg, 1/3 cup parmesan, pesto, and 1/4 cup mozzarella. Add salt and pepper to your preference. 3.) 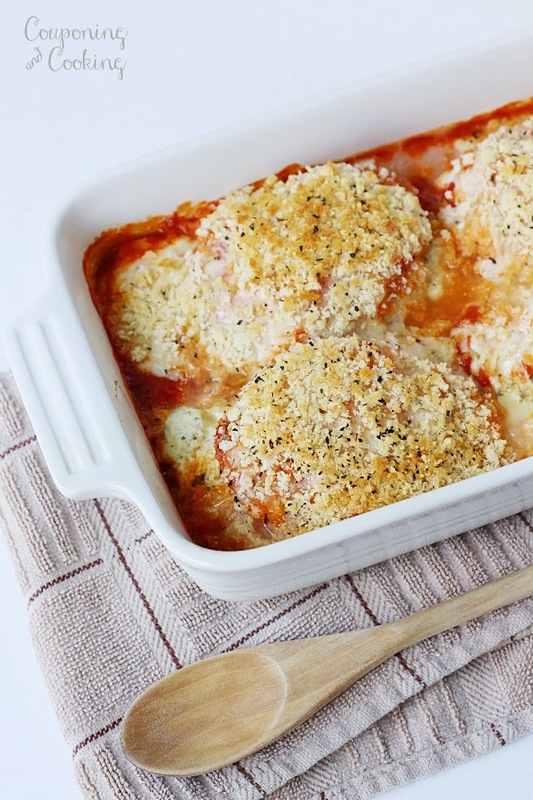 Spoon a layer of the mixture on each chicken cutlet and gently roll up the chicken with the filling inside. 4.) 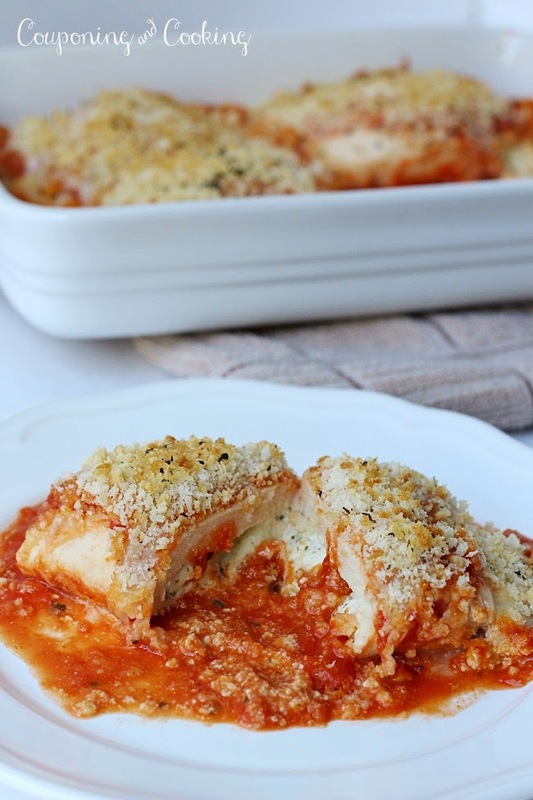 Place each rolled chicken breast in the pan on top of the pasta sauce. 5.) 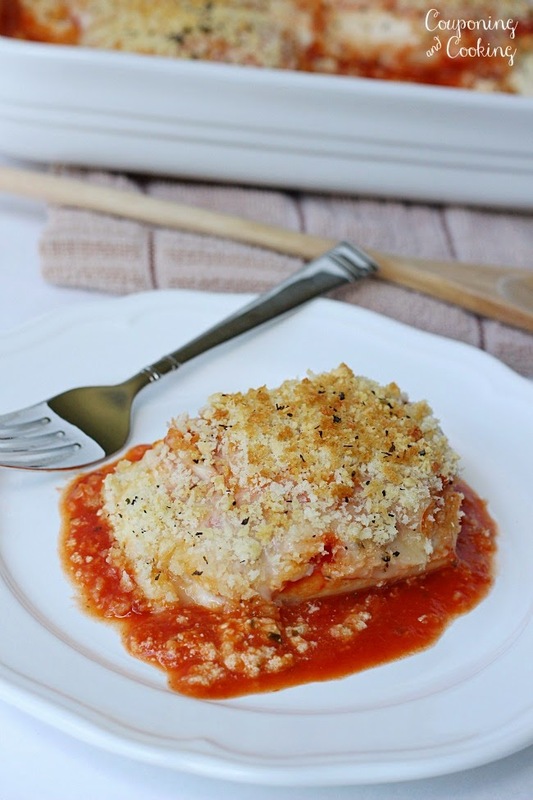 Mix together your panko bread crumbs and the 1/4 cup grated parmesan and add salt and pepper to taste. 6.) Top each roll up with a heaping spoonful of pasta sauce. 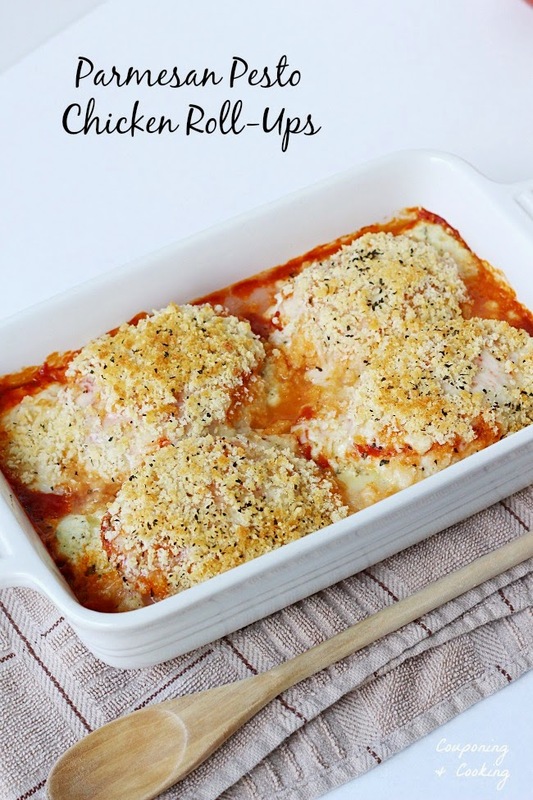 Then sprinkle each with a 1/4 cup of the remaining mozzarella and top with 1/4 of the panko parmesan mixture. 7.) Bake at 350 degrees for 30-35 minutes. Depending on the thickness of your chicken you may need to bake it for longer to make sure that the chicken is cooked all the way through.